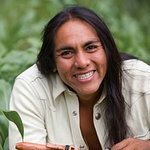 Two-time GRAMMY winner, Robert Mirabal maintains a traditional life, keeping the centuries-old customs of the Taos Pueblo people, Robert has been described as a Native American “Renaissance man” – musician, composer, painter, master craftsman, poet, actor, screenwriter, horseman and farmer—and travels extensively playing his music all over the world. Mirabal founded the Middle Road Foundation to help Taos Pueblo children and their families. Robert is working with the Peacing It Together Foundation to create a series of fundraising concerts to be held in 2010. Google trends for "Robert Mirabal"
We don't have any news stories about Robert Mirabal. We don't have any videos related to Robert Mirabal.